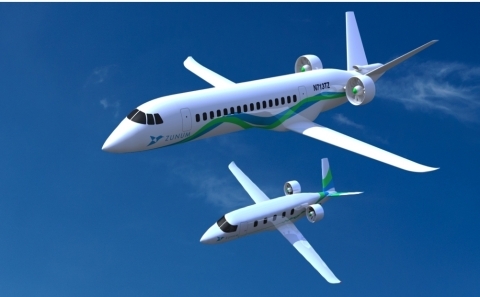 SEATTLE--(BUSINESS WIRE)--Zunum Aero, a pioneer in electric aviation, is developing regional hybrid-electric aircraft for the early 2020s, offering unmatched door-to-door speeds and reduced costs for flights from 700 miles at launch, to over 1,000 miles by 2030. Zunum Aero aircraft are designed to take aviation into the future: enabling frequent service to the nation’s network of over 5,000 underutilized regional and general aviation airports. These 10 - 50 seat aircraft will pave the way to a golden era of fast and affordable electric air travel, reversing the 70 year consolidation of air services. Zunum Aero is backed by Boeing (NYSE: BA) and JetBlue Technology Ventures, a subsidiary of JetBlue Airways (NASDAQ: JBLU); both believe that regional travel is ripe for transformation. With multiple patented technologies already in place, Zunum Aero has designed an innovative class of hybrid-electric aircraft and is developing technologies to create a regional electric air network. These aircraft, as part of new regional electric air networks, will offer a fast, flexible and affordable alternative to highways and high-speed rail, operating point-to-point and as feeders to hub airports. 75% drop in community noise, opening up all-hours access to smaller airports. Zunum Aero is three years into development with an experienced, multidisciplinary team across aircraft, aircraft engines and electric vehicle disciplines, including leaders of two flying electric vehicle programs and the leader of a NASA-funded program on drives for electric airliners. In addition to backing by Boeing through its Boeing HorizonX innovation cell and JetBlue Technology Ventures, Zunum has a long-term partnership with the Center for Power Optimization of Electro-Thermal Systems, an NSF Engineering Research Center at the University of Illinois, and a network of collaborators across leading Universities and government labs. The team has also been actively engaged with the FAA since 2014 to drive development of certification standards for electric aircraft. A complete set of standards for electric aircraft are expected by 2018, and the first electrics are likely to certify in 2020, in time for the first Zunum aircraft to roll off a production line. “Boeing HorizonX is investing in Zunum because we feel its technology development is leading this emerging and exciting hybrid-electric market space. This technology and customer approach has the potential to transform the market for small, short-haul aircraft that can use smaller regional airports,” said Steve Nordlund, Vice President, Boeing HorizonX. JetBlue Technology Ventures invests in, incubates and partners with early stage startups at the intersection of technology, travel and hospitality to improve the entire travel experience. The company prioritizes investments that advance the customer-centric journey; technology empowered customer service; the future of operations and maintenance; revenue management, sales & distribution; and new regional transport ecosystems. Founded in 2016, JetBlue Technology Ventures is a wholly-owned subsidiary of JetBlue (NASDAQ: JBLU) and is located in Silicon Valley, Calif. For more information, visit JetBlueVentures.com. Zunum Aero is building a family of commercial hybrid-to-electric aircraft designed for regional transit, and powered by quiet range-optimized powertrain and propulsion technologies. The company’s vision is to develop 1,000-mile electric air networks to bring fast and affordable travel to every community. Founded in 2013, Zunum Aero is located in Kirkland, Washington. To learn more, visit Zunum.aero.